I just wrapped up my first ever stay at the Park Hyatt Paris Vendome. I feel like in the miles & points world, staying at the Park Hyatt Paris is a rite of passage, much like showering on an Emirates A380, redeeming miles for Cathay Pacific first class, and staying at the Park Hyatt Maldives. Yet this was my first ever stay at the Park Hyatt Vendome, even though I’ve been to Paris many times. On the plus side, nowadays you can use a Globalist suite upgrade for award stays, which is an awesome benefit, so I was able to confirm a Park Deluxe Suite at the time of booking. I was curious what the hotel would be like, as I’ve heard mixed reports. I tend to think there are two types of luxury points hotels — there are some points hotels that are truly world class hotels and the absolute best in a city, and then there are points hotels that are really good when you consider that you’re redeeming points. Let me give a couple of examples. The Park Hyatt Sydney is objectively the best hotel in Sydney. The hotel isn’t just great when you’re accounting for the fact that you’re redeeming points, but rather it’s actually a spectacular, world class, city hotel. Then there’s the Park Hyatt Maldives. I absolutely love the hotel, it’s an insanely good deal at just 25,000 World of Hyatt points per night, and the island it’s on is stunning. However, it’s most definitely not the best hotel in the Maldives. In other words, I’m thrilled to stay there on points and have a great time, but if paying cash, there are more luxurious properties at that price point. To be honest, I was expecting the Park Hyatt Paris to be in the same category as the Park Hyatt Maldives, which is to say that I thought it would be a very nice hotel for a points hotel, but wouldn’t actually be among the best hotels in Paris. Last year I got engaged at the Shangri-La Paris, which I booked because I thought getting a terrace room overlooking the Eiffel Tower would be pretty special. The hotel was spectacular, and I was expecting that the Park Hyatt would be a significant downgrade compared to that. I’ve gotta be honest, I’m blown away by the Park Hyatt. It’s not just nice when you take into account that you can redeem points here, but in many ways I prefer this hotel to the Shangri-La Paris, which is saying a lot. The Park Hyatt has apparently just undergone a soft renovation. I’ll be writing a full review soon, but in this post wanted to share my initial thoughts. While we already had a confirmed suite upgrade, we got further upgraded to a prestige suite. The hotel was sold out during our stay, so I suspect that’s the reason we got a further upgrade. The suite was incredible, in terms of the amount of personal space, and also in terms of the decor. It had the perfect balance of feeling classic while feeling updated and in good condition, which not many hotels can do well. As a Globalist member breakfast was included, and you can choose between having breakfast in the restaurant or room service. The first morning we had room service, which was a treat. For the remaining days we had breakfast in the restaurant, as I thought that was an even better experience, if that’s possible. The hotel’s public areas are also lovely, with a very nice courtyard, and also a cozy lobby with a fireplace. The service at the hotel impressed me across the board, with everyone being attentive, friendly, and polished. Lastly, the location of the Park Hyatt is tough to beat, at least for our purposes. We could walk almost everywhere by foot, from tourist sights to great restaurants. Anyway, I’ll have a full review soon, though in the meantime I can’t recommend the Park Hyatt Vendome enough. This hotel exceeded my expectations, and while I thought it would just be excellent for a points hotel, I objectively find this to be an excellent property, thanks to the beautiful decor, excellent food & drinks, service, and location. Now to be clear, I’m sure there are marginally better hotels in Paris. However, for my dates the paid rate would have been 550EUR prepaid, which is significantly cheaper than properties like the Four Seasons George V, for example. Even on a paid rate, I think this hotel is a comparative bargain in the luxury sector (when you look at how much some other luxury hotels charge). If you’ve stayed at the Park Hyatt Vendome, what was your experience like? It was great. It’s an amazing hotel. And it’s not that phony service masquerading as luxury either. Unfortunately, it was too fancy for me. I like nice things and places but I never felt comfortable there. Weird to be in the points and miles game I guess. I love the PH Vienna, for example, and even though it’s a little decrepit, the Hotel Du Louvre. More my style. I stayed at the Prince de Galles back in 2014, and I noticed you stayed in the exact room I did when you were there. Lucky, how do you believe the two properties compare in terms of location and overall quality? Would you say the Park Hyatt is nicer? I stayed when it first opened, the heat wasn’t regulated but blasting and the room was tiny. Breakfast was great, but at the time, the Westin Vendome started giving me amazing suites and I thought that was a much better hotel. I keep wanting to try it again (this was like 10 visits to Paris ago), but the TSUs only upgrade to a junior suite. I think in order to claim a hotel is the greatest, you need to stay in a regular room. @ Dav — That’s horrible, as I found the service to be excellent. May I ask what happened? @ Noah — I loved the Prince de Galles as well, but I just thought the finishes at the Park Hyatt were a step up, and personally I prefer the location. I also found the service at the Park Hyatt to be flawless, while I didn’t have too much experience with the service at the Prince de Galles. It’s definitely the best Starwood hotel in the city, though. There is no comparison between George V FS and Park Hyatt. The idea that the former could be “marginally better” are the words of someone who clearly had never bothered spending a paid stay in a suite at the former. Park Hyatt Paris is fine but the point you’re making is…just completely inaccurate if you’ve tried paying cash at both. This is a US travel blogger bucket list. There are amazing boutique hotels in Paris that provide a much more French atmosphere. Also, Paris is the last place I want to enjoy a hotel. It is a place to be outside enjoying this amazing city. I have just stayed there briefly in March – the service was HORRIBLE. On comparison it made Le Meriden look like a true Palace hotel, if that’s possible! 1. The room wasn’t ready by 5 pm. 2. When asked for an umbrella on a rainy day, the doorman brushed me off saying that “it’s the only umbrella I have”, and I spotted that there’re dozens of them sitting near the door. 3. Again, the doorman was rude and didn’t open the doors for me when I returned. 4. There’s a card on the key slot indicating that welcome gift couldn’t be delivered due to DND sign, and I called three times yet no one bothered to deliver it again. 5. Placed my shoes in the shoe bag for shoe-shining, yet they apparently forgot to do it. My shoes appeared only after a few calls (and 30 min+), and apparently they were in the same bag without any shining. 6. The bin wasn’t cleared and slippers weren’t placed on mat during turn-down service. All in all, it’s a great option using points but not so much if I had to pay cash for this level of service. Still, happy to know that you enjoyed your stay! Having stayed in a variety of top end Paris hotels over the years, I find the chain affiliated 5-star hotels to be largely interchangeable. They’re nice, but none of them, with the possible exception of the Sofitel Le Faubourg, seems terribly “French”. Rather they’re the pinnacles of their respective brands “city” properties. Unless I’m actively working towards status or in a position to take advantage of status, I much prefer the Le Meurice and Le Bristol, both mostly on account of the spectacular service at both. At both I’ve received treatment from staff that’s both friendly and uniquely designed to acknowledge my tastes, needs, and interests, rather than treating me as just another American or just another high roller…accomodating without being obsequious. I suspect you might have gotten a little better treatment than most given your a travel blogger. I too have had a similar suite before and loved it. However as many of us long time visitors to the PHV it has not kept up nor has the service maintained it’s level of service, and yes I have witnessed the front desk in “action” before some of which was due to guest demands and some self inflicted “I’m French” attitude. Try Le Meurice . . . on a different level. Shangri-La and Park Hyatt are the two worst Palace hotels in Paris. Not in the same league with other Palace hotels. I think the price differences tell you everything. Just stayed at the PH Vendôme last month and found it to be perfectly lovely and all that: service was on-point; bed was impeccable; bathroom was well appointed and spotless; and the little touches were there. Got a nice upgrade, too, thanks to my Hyatt status, which included the breakfast – great buffet. All that being said, I simply cannot imagine ever paying what they ask for to stay here. Truly, it is a well-oiled machine and full of beautiful yet simple French style. But no, not for €2,000 to stay in a small suite. I stayed here 4 years ago for two nights in three rooms with my wife and 4 daughters (13, 11, 10 and 8 years old) as a diamond and a gold. Despite making our reservations months in advance and requesting rooms together, we were placed on 3 different floors. One room was upgraded one level, the others were basic rooms. I politely requested that they try to rearrange this for us and made one other request of the front desk, which I do not recall. They advised that they would look into it and get back to me as soon as possible. I never heard from them again. I asked again later that day and again never received any response. We also had room service breakfast and they missed part of the order. Considering pretty much everyone orders the same thing, seemed odd, but they fixed it in relatively short order. When we were checking out, I asked at the front desk if they could hold our luggage for us. They agreed and we went to the front to wait for them to collect it. Nobody did anything. I returned to the front desk and requested this again. Again returned to the front of the lobby and again received no attention. Finally spoke to the doorman and he managed to get someone to take our luggage. Upon returning afterward, we called an uber to collect us and then had to make them wait while we tried for several minutes to collect our luggage again. Then, apparently miffed at us, no one helped us with our luggage except the uber driver. My in-laws were staying at the IC Paris Le Grande and received much better service. From my perspective, they also received a nicer room, much more “Parisien”. We also stayed at the WA Trianon Palace at Versailles (only golds then) just before the PH and received wonderful service, upgraded multiple levels for all three rooms, including a suite for my wife and I. All in all, I found that the PH was all about show and not about treating guests well. It may very well be that they simply don’t appreciate their wonderful hotel having children as guests. I, for one, would never return and regretted the points and certs that I spent on it. Lucky, you had the exact same room I did when I stayed at the shangri la last year! My parents stayed at PH Vendome on free night certificates, and since they have zero status it was just a regular room. They were definitely NOT impressed. They thought it was a tiny room and hotel in general is overrated. Maybe with suite upgrade and all the loyalty perks, you get treated like a king and have a much better experience, but that’s not how a 5-star hotel is supposed to be run. THere shouldn’t be such a huge spread between top and bottom tier guest experiences. We stayed there last month. It was lovely. However. As a Globalist I’ve been treated much better elsewhere. And the lack of a lounge is annoying. I was sorry I used so many points on it. We loved Intercontinental Paris more. Just more of a cute Paris experience while still being luxury. 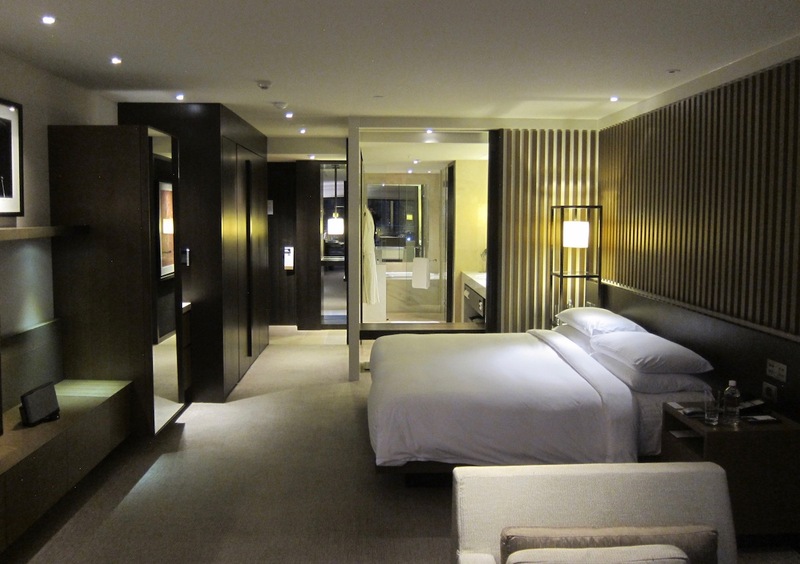 And I recently stayed at Park Hyatt Seoul. Which also has no lounge. However the rooms are amazing and it was much better service. I’m at Grand Hyatt Taipei right now and adore it. My suite is beautiful and the staff has been helpful without being intrusive or stuffy. You rarely hear these negative reports about the PH Vienna. Back in the time of the Club Carlson deal of stay 1 get 1, I enjoyed the Radisson Blu Champs Elysees and had an awesome breakfast like that. I have not had the chance to go Vendoming. LOL I have been to PH Sydney and PH Tokyo. Honestly, I didn’t think that PH Sydney was all that, but it was nice. PH Tokyo was very impressive cause we’re not city people and it was high in the sky. PH Vendome is just perfect. We’ve stayed there twice and can’t wait to have a 3rd. Glad to hear the location of this PH is “tough to beat” because in the second half of June I will be staying for 6 nights at “Hilton Paris Opera”, which, according to Google Map, is located just a 12-min walk from the PH. My cash rate for a standard room (€299/night) was reasonable for such a premium location because I’d just gotten the HH AMEX Aspire card and decided to book a discounted BUT INFLEXIBLE advance purchase rate that would be billed immediately to contribute about half of the minimum spend of $4K I needed to collect the Aspire’s 100K HH signup bonus. I’ve stayed at the PH Vienna – thought it was absolutely wonderful from top to bottom, but I did note (noted, not complained, because the GM asked me and I thought it was worth mentioning) that the bathroom in my suite looked a little battered. A crystal was missing from a lampshade, an object had a large chip in it, and there were several scuff marks on the walls. Didn’t bother me that much but I thought it was odd. Was this your experience as well? Is the PH Vienna really that much better than the PH Paris? I realize you like to save money, but…you’re in Paris. I can understand having breakfast in the restaurant once to sample things, but every day? Yikes. We have also stayed at the PH Vienna (on our 25th anniversary trip last year). We found the building amazing and the room we stayed in superior to the Vendome and the location is spectacular and, for most of our stay, the service was better as well, however, it seems like we must not be Park Hyatt people, because we also had trouble with the service at this hotel. We arrived at 1 pm so too early to check in and were advised that they did not have our room ready but they would put a rush on it and get it ready for us within the next hour. We expected this and happily went across to the Christmas market in the square and wandered the old city until the appointed time. When we returned, they apologized again and said that it still was not ready but they would upgrade us and would have the upgraded room ready in another hour. We went out again, not quite as happily, but happy to hear we would be upgraded. When we returned again nearly 2 hours later, the same poor front desk representative informed us that her manager told her we could not have the upgraded room and that our (back to basic) room was still not ready (now it was about 4 o’clock). We went across to the Christmas market once again, not nearly so happily, and returned after another half hour to finally be allowed to check into a room. Happily, the service for the rest of our 3 night stay was excellent. Despite the issues checking in, we likely would go back to stay at the PH Vienna. Stayed at this hotel for 2 nights. I had heard so much about it and was really looking forward to it. Having stayed at many highend hotels worldwide, I was not impressed. I did not have any poor experiences but I thought the place was just average and have no desire to ever come back. I recently stayed at the Sofitel Le Grande in Amsterdam and liked that hotel far better and am looking forward to going back there. The service, room, and facility was so much better. (I stayed at a one bedroom suite). The Peninsula is much more than ‘marginally better’ than this property! My point, PH Vendome can’t be one of the best hotels in Europe and be so much worse than the PH Vienna. Great hotel and the breakfast was amazing. My first story about what points/credit cards can do for you. It was a $1K a night when we stayed and it was free with the Hyatt credit card. Lol there are so many hotels in Paris which are far superior (not “marginally”) to the Park Hyatt. I’ve stayed at the Park Hyatt, it’s a good hotel (with very average service on my stay), but Paris has some phenomenal hotels, you just can’t stay at them using miles and points! I used cash plus points and a DSU a couple years back. The room it confirmed in is hardly a suite. I don’t think it even qualifies as a jr suite. If I had gotten a further upgrade to a true suite I thibk my perspective would be different but honestly the room was incredibly underwhelming. Service was ok. Breakfast solid. At the time the daily rate was somewhere in the neighborhood of 800 Euros for an entry leve room which is definitely not worth it…. Re: location. Everyone has different taste and things they like to do when they travel. As someone who is not “fancy”, the area around PH Vendome is not at all my cup of tea. Much prefer the areas around the Marais, Republique, and Canal St. Martin. Still walking distance to many tourist sites, but so much more interesting neighborhoods. If you want to window shop at expensive boutiques and see a lot of black cars and the like, the PH Vendome is for you. If you like a bit more diversity (in many ways), I wouldn’t recommend staying in that area. I’m not one to pass up a free night or two, but I would rather use 30k UR points on 2 nights for $450 at a cheaper place further east. I redeemed a free night here as a globalist last fall so I got the lowest tier of room overlooking the courtyard. The room was a bit warped but still nice. Service at the front desk was terrific. Restaurant at breakfast was forgettable. Def not the Blue Duck Tavern! I stayed there a few years ago and received a chilly reception and was a diamond had used a certificate. Someone saw that the front desk was rude and gave me a present from the Hotel. Am going again in May, already had issues booking pointed it out to the Globalist desk, they tried to get the hotel to upgrade me due to the reference on the website but no go. I am using cash and points and suite upgrade. We will see what happens,I hope it all goes well as we will be there for my son’s wedding. My experience is limited to 1 points redemption night . I wanted to check it out to see if I liked it for longer stays. It was *OK*, certainly not “amazing” or even “outstanding”. Would I pay €600 for it? Not in a million years given the alternatives available. Comparison with PH Vienna is chalk and cheese. George V ( admittedly ancient experience from trips with my parents) is another world cf PH and any suggestion of close comparability is risible. Maybe it’s just me but I find the decor to be quite bland? You should try out the FSGV or Le Bristol or La Réserve or the new Rosewood Hotel de Crillon. Go to a 3 Star restaurant, please!! Epicure or Le Cinq or Guy Savoy or Pierre Gagnaire, etc.! @DCS please let us know how is the experience. I would love to know if it is worth staying there. I already got my 100,000 points bonus and I love it. Even considering the daily getaway promotion from hotel, since the deal looks really good. @farnorthtrader @Emily can you please share more of your experiences at the IC Paris? How were the rooms and service? Better if you were an Ambassador? I would love to experience the great “Parisien” experience, but I definitely do not need the typical French attitude. The Ritz is by far the best hotel in Paris. Come on. I’d put The Peninsula at No. 2 or 3. Personally I find staying at boutique hotels or like independent hotels in Paris to be more fun then international franchise. Like they usually surprise me interms of their service and their rooms (a good way ). I really recommend hotel George sand, the hotel is so cozy and the stuff is amazing. The rooms is also very chic in a very French way to me. If I haven’t mistaken, the hotel was actually the writer George sand’s home in Paris, and the loby feels like a library with her books alone the wall. Great restaurants around the hotel and like 2 minutes away from Printemps and not so far from Lafayette either. The hotel is also situated in like a very old and romantic, very French neighbourhood, which just makes it so much more amazing. The price is also not so bad, and I think it totally worth it with the very friendly and attentive stuff. @Stanley, in my experience, my in laws were treated with utmost respect and when we visited with our entire crew, the doormen and other staff that we met treated us well. Our in-laws received the base room, on points, with no upgrade and had no status. The room was also small, similar in size to the PH. Compared to the PH, which is sleek and modern, the IC is very much what you would think of a traditionally Parisian. Much more ornate and with more traditional furnishings. It is more to my taste, which probably helped it in my eyes, however, the difference in service was substantial. I love this hotel!! I have stayed her about 6 different times with either my husband or our daughter. The first time we stayed was my daughter’s birthday which they saw on her passport and they really made it special. Each time we stayed since they have always upgraded us and left food,champagne and gifts in the room. They’ve even done this when we booked additional rooms for our French family. This past summer I sent an email letting them know that our kids were coming and once again they took incredible care of them. All of our bookings have been with points and we’ve never felt uncomfortable there. On one visit with my daughter, to her embarrassment, the rain got the best of me and I strolled into the lobby in my tacky plastic rain poncho and my rain soaked, squeaking sneakers without an eyebrow raised from anyone…. only the offer of a towel to dry off so I didn’t slip and a pot of coffee to be sent up to our room as a kind gesture. If this isn’t 5 star service I don’t know what is. We have stayed at the PH Vienna as well with the same type of service. Maybe we have been very lucky, maybe it’s because my husband and kids are French, or maybe we just let them know of how appreciative we are of their service. So if anyone is thinking of staying at the PH Vendome…. go for it!!!!! I’ve stayed at Park Hyatt Vendome many times (3 times this year). Some rooms are better than others for sure. My favorite “basic” (using points) rooms are 401 and 501, which were being renovated when I was there in January so I got a huge room with two bathrooms and a separate living room. It was not as luxurious as the room Ben got though. The closet and bathroom are the best in 401/501! The location is perfect for me. I’ve stayed all over Paris in my nearly 25 visits and this is my current favorite “go to” hotel. They switched their bath products which I didn’t care for as much on my last trip. I had their multi-course dinner last year and it was really good and not THAT expensive for Paris. I don’t have great status with Hyatt. Lost Platinum when they went to World of Hyatt (not a fan of the new program). This sounds an awful lot like a honeymoon. Just sayin’. It’s Paris- I stay outside all day and come to the hotel to sleep only. We stayed there in May of last year. We used the two free nights from the old Hyatt signup bonus plus used points for a third night. After booking, I called the hotel to explain that it was our 10 year anniversary and I wanted to surprise my wife with something special. I was transferred to the Rooms Manager who explained she would do everything she could to make it memorable. Several months later when we actually arrived, while checking in the nice lady noticed we had made special requests and immediately went away to find the individual I had spoken to on the phone months prior. Also, this was 10:00am and well before checkin time. The manager came out to introduce herself and asked if I remembered speaking to her on the phone. She then personally escorted us up to our room, presenting the upgraded suite, the rose petals leading from the floor, on the bed, around the bathtub, and the bottle of champagne ( I’m not good at brands, but we looked it up and it was over $100 USD). Everyone was so polite, location was nothing less than perfect, and by far it is our best hotel stay to date. I would gladly pay their regular room rates to stay at this amazing property again. As a known travel blogger, your reviews now need to be taken with a grain of salt. There’s nothing ‘typical’ about the experience, service or upgrades your receive. The big chains like Hyatt know who you are and have your work info logged into their customer relationship management systems. These reviews therefore should be read like an advert more than a genuine review. In this case, on the PHV, I’ve lost count of the number of reviews I’ve read about this hotel. They’ve all started to read like the very same review. I’m not sure of the purpose of repeated, samey samey reviews by Board Area bloggers? @DCS @Stanley. I am staying at the Hilton Paris Opera right now (four night stay). Great location and hotel has been recently renovated. As a Diamond, we received a double upgraded room. Even though we arrived hours before checkin and the hotel was full, they had us in our room by 11am. We unfortunately hit two days of the railroad strike and the hotel helped us rearrange our schedule with third parties successfully. I do not feel we are treated any differently even though all four nights are free. There is a lounge but it is being renovated for two weeks so can’t report on that but the morning breakfast is quite good and free for Diamond. Wow, brings back awesome memories. My wife and I stayed here for 6 nights in 2014 (4 free nights from the Chase Visa cards and 2 nights with points). Absolutely loved this hotel. Had temp. Diamond status and loved the free breakfast & upgraded room. Location couldn’t be beat. I was just there April 11th through 13th on points and as explorist member was also treated very well and was upgrade to a deluxe room without prompting. Probably because it was sold out for a conference. Service was phenomenal at all times. Frankly I was underwhelmed by breakfast in the restaurant and now wish we had done it in our room. It would be great if you could review Le Bristol. It is simply in my opinion the best hotel in Paris if not in the world when it comes to service and food : it features a 3 star AND a one star restaurant… I agree though that location is not the best for tourists. Remember that the historical palaces of Paris are le bristol, le crillon, le ritz, le royal monceau, le meurice, le George 5 and le plaza athénée… Those are the ones you should compare. The peninsula, park hyatt and shangri la somehow like the grandeur of the other ones…and I don’t even mention the mandarin oriental. @Dav You should have gotten more than 30k points. You should have demanded his dismissal or at least a demotion. Make it a memorable experience for him. It’s time for customers to take power back from abusive hotel and airline employees. To be sure, there are also unpleasant customers, but no customers equals no employment. The pendulum has swung too far in the other direction. “From 2 to 17 April 2018, our Executive Lounge will be opened from 5:00 pm to 9:00 pm. Continental breakfast will be served in the Breakfast room”, which may be due to the renovation that you wrote about. It should have been completed by the time I check in in late June. Looks the same to me as it did when I stayed there 12 years ago. Tired looking and unfriendly staff. @DCS. Not complaining. They are giving us the full breakfast in the dining room (not just continental) and got back to the hotel on two nights early enough to enjoy their multiple appetizers that were served in a corner of the restaurant reserved for Hilton elites. I think you will like the hotel. @DSK thank you for your feedback. Sorry. So, if I read it correctly they gave you a double upgrade on top of what you originally booked? Wow!!! Did you enjoy the breakfast? Do they have afternoon tea and cocktail hours for elite members? Thank you again! @farnorthtrader thank you for your very detailed feedback. So, I guess since they had no status, they did not receive any upgrade or amenity of any kind? However, the impeccable service made up for it? It really intrigues me. I am so glad to hear that they treat all guests well. For a possible near future trip to Paris, I would have to truly consider between the Hilton Grand Opera and IC Paris. @Stanley. Double upgrade on top of what I had booked is correct. Room was updated three years ago so everything (plugs and USB ports everywhere and a rainbow shower plus handheld) is up to modern standards. My room would have been about $600 per night if it weren’t free. Can’t say you will get that old world Wow standard of a more expensive hotel but room was very large for a city hotel and the lounge takes care of your breakfasts (which were absolutely great) and dinners if you are tired and don’t want to leave the hotel after a long day. We found the staff were friendly without the attitude you read about in some other hotel reviews. I am sure it is not the most luxurious place to stay in Paris by any means but it worked fine for us and my bill at checkout for four nights was zero. @DSK thank you again. I will definitely look into this hotel in the future. Quite expensive per night, but glad to hear that you wisely use the points for this stay. I guess the hotel is quite good, overall. Must treat their elites well, then. Better than the former Hilton Shanghai. Not good at all. Really unimpressed. Ah, did you get a good view of the city? Hello, I’ll be spending 4 nights in Paris in August. Would it be a good idea to redeem 60k Chase points for 2 nights here and then get a different cheaper hotel for the other 2 nights? I don’t have any Hyatt status. I’m sure that makes a difference on your stay.